According to a recent news article from My Northwest, some hospitals are now offering warranties to patients who undergo total knee replacement surgery. As the article discussed, and Boston knee replacement attorneys are aware, many hospitals make more from procedures that go wrong than those done without incident. The hospital, doctors, and medical device manufacturers make money every time a procedure is performed. If the artificial knee needs to be removed and replaced, the cost of that second surgery and all related diagnostic procedures are typically charged to the patient. Hospital administrators are claiming that they are able to offer this warranty because are they are confident in the work provided by their practitioners, and they also hope that the program will alleviate concerns from many prospective patients who are considering whether or not to have the surgery. While this may be a good step toward hospitals taking accountability, if you have had a knee replacement surgery and are experiencing problems, you should speak with your products liability attorney before signing any documents provided by the hospital. 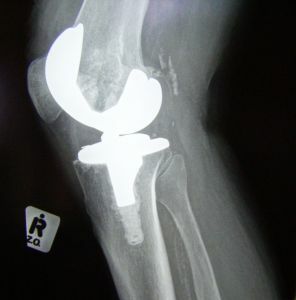 There has been no mention of whether accepting a second knee replacement under the new warranty will require a waiver of liability for any negligence on behalf of the hospital or its employees, or the company that manufactured the artificial knee, and it is important that you have someone on your side to fully explain your rights. Some of the problems caused during knee replacement surgery involve traditional medical malpractice claims against the hospital, surgeons, or other health providers. Other times, as we have seen with several artificial joints, the case involves a defective product. Artificial knee manufacturers have been making billions of dollars from the increasing numbers of patients who are having total knee replacement surgery each year. The marketing arm of the companies drives some of this uptick in surgeries, and some of the increase is due to orthopedic surgeons pushing the surgery, which can net them big profits. One of the major claims in products liability negligence actions involving artificial knee replacements involves claims that providers failed to warn patients of known dangers. As we have seen from the discovery process in these lawsuits, manufacturers are aware of problems with their medical devices but have not told doctors or the Food and Drug Administration (FDA) about these risks. Part of the reason that companies are getting artificial knees to market without conducting studies of adverse reactions and providing the results to the FDA is due to a loophole in federal regulations that allows medical device manufacturers to push a product through regulatory approval on a fast track to the market if a device that is similar is already on the market, even if that device was made by a competitor. In the case of an artificial knee, it is easy to make an argument that if one knee is already on the market, any new products are similar enough that fast tracking approval is warranted. In addition to failure to warn causes of action, some of the artificial knees on the market are simply defective, and no potential benefits could outweigh the risk involved.